My friend Ana is dong really well with her nail decal business, probably because I keep buying her stock! 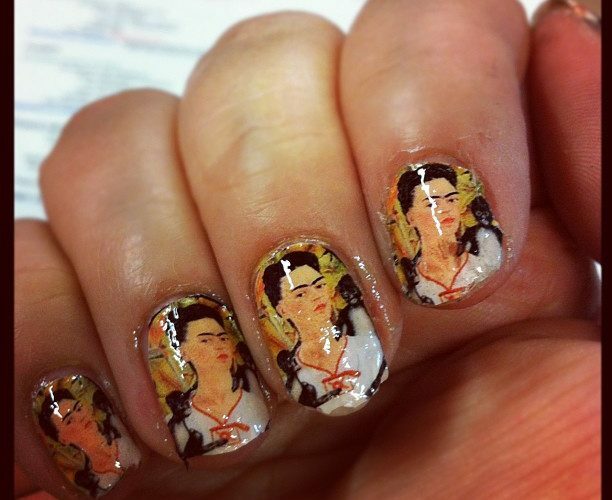 Here are some Frida decals I sported recently. I wore these to an art conference where I knew there wasn’t going to be a lot of Latino art. I wore all jewelry made by Latina crafters and artists and topped it off with these Frida nails for happy energy! Here is where you can buy a set too! NOTE: I took the picture before I cleaned them up, I couldn’t help it, I was too excited and snapped a picture!